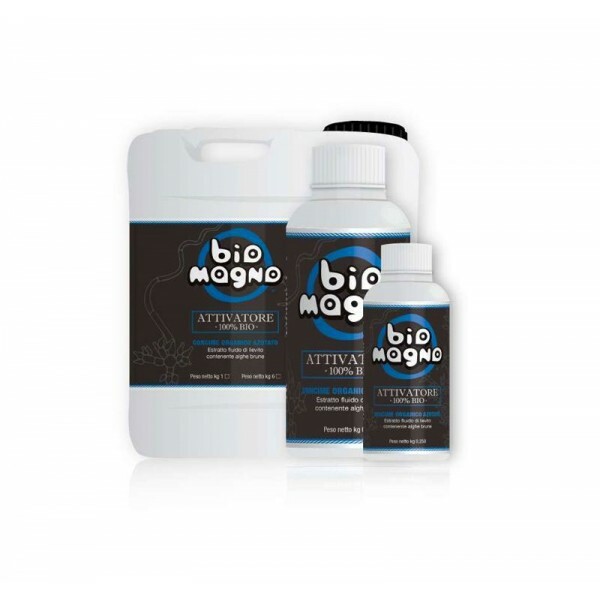 100% BIO ACTIVATOR is a fluid organic fertilizer based on plant extracts with polysaccharides, noble proteins and amino acids with a high carbon content of plant origin that is the basis of fertility and microbial activity of soils. Yeast fluid extract containing brown algae. 100% BIO ACTIVATOR is a fluid organic fertilizer based on plant extracts with polysaccharides, noble proteins and amino acids with a high carbon content of plant origin that is the basis of fertility and microbial activity of soils. The product favors the development of microflora and microfauna, favoring the suction capacity of the plant by the circulating solution containing the nutritive elements. The formulation has a revitalizing effect of the soils and a high capacity for humification of crop residues, with consequent inhibition on the development of pathogens. The formulation is additionally additioned with an active organic preparation containing proteins, vitamins, polysaccharides, polycarboxylic acids, betaine, mineral salts, amino acids (lysine, methionine, tryptophan, aspartic acid, glutamic acid, proline, glycine and arginine), oligosaccharides, enzymes ( cellulase, protease, amylase, lipase), rhizosphere bacteria (Pseudomonas spp., Bacillus spp., Actinomycetes), Saprophytic mushrooms (Trichoderma spp.). - Revitalizes the substrates and increases the presence of humus in the soil. - Enhance useful bacterial activity. - Strengthens the immune system of plants. - Increases the production of dry matter. Dosages: 0.5ml - 1ml liter combined with the basic fertilizer as a cultivation scheme. Composition: Organic Nitrogen (N) 1.2%, Organic Carbon (C) of organic origin 20%, pH 6.5. Organic substance with nominal molecular weight Raw materials: fluid extract of yeast containing brown algae obtained by extraction with water or acid and / or alkaline solution.